Edgar A. Levenson is a key figure in the development of interpersonal psychoanalysis whose ideas remain influential. Interpersonal Psychoanalysis and the Enigma of Consciousness builds on his previously published work in his key areas of expertise such as interpersonal psychoanalysis, transference and countertransference, and the philosophy of psychoanalysis, and sets his ideas into contemporary context. Combining a selection of Levenson’s own writings with extensive discussion and analysis of his work by Stern and Slomowitz, it provides an invaluable guide to how his most recent, mature ideas may be understood and applied by contemporary psychoanalysts in their own practice. This book explores how the rational algorithm of psychoanalytic engagement and the mysterious flows of consciousness interact; this has traditionally been thought of as dialectical, an unresolvable duality in psychoanalytic practice. Analysts move back and forth between the two perspectives, rather like a gestalt leap, finding themselves listening either to the "interpersonal" or to the "intrapsychic" in what feels like a self-state leap. But the interpersonal is not in dialectical opposition to the intrapsychic; rather a manifestation of it, a subset. The chapters pick up from the themes explored in The Purloined Self, shifting the emphasis from the interpersonal field to the exploration of the enigma of the flow of consciousness that underlies the therapeutic process. This is not the Freudian Unconscious nor the consciousness of awareness, but the mysterious Jamesian matrix of being. Any effort at influence provokes resistance and refusal by the patient. Permitted a "working space," the patient ultimately cures herself. How that happens is a mystery wrapped up in the greater mystery of unconscious process, which in turn is wrapped into the greatest philosophical and neurological enigma of all—the nature of consciousness. 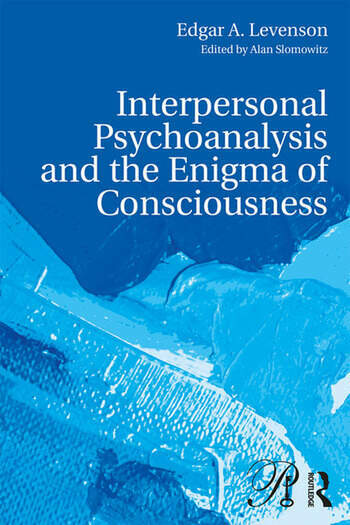 Interpersonal Psychoanalysis and the Enigma of Consciousness will be highly engaging and readable; Levenson’s witty essayist style and original perspective will make it greatly appealing and accessible to undergraduate and postgraduate students of psychoanalysis and psychoanalytic psychotherapy, as well as practitioners in these fields. Edgar A. Levenson, M.D, is Fellow Emeritus, Training, Supervisory Analyst and Faculty at the William Alanson White Institute. He is Adjunct Clinical Professor of Psychology at the NYU Graduate Studies Division, Honorary Fellow at the Postgraduate Center for Mental Health, Honorary Member of the American Psychoanalytic Association, Life Fellow of the American Academy of Psychoanalysis, and Distinguished Life Fellow of the American Psychiatric Association. Winner of the 2006 Mary S. Sigourney Award, he is author of over 110 publications, including Fallacy of Understanding (1972), The Ambiguity of Change (1983) and The Purloined Self (2016). Alan Slomowitz, Ph.D., is a graduate of the William Alanson White Institute of Psychiatry, Psychoanalysis and Psychology. He is a Supervisor of Psychotherapy at the White Institute, on the Editorial Board of Contemporary Psychoanalysis, and the Internet Editor of the Contemporary Psychoanalysis in Action blog. Dr. Slomowitz edited the new release of The Purloined Self (2016) with Dr. Levenson. Dr. Slomowitz is in private practice in psychoanalysis and psychotherapy in New York City. "Much like the subject matter of this wonderful book, Edgar Levenson is an enigma. Even though he has published for over fifty years, his work is continuously contemporary. Even though he is the most well-known and subtle theorist of interpersonal psychoanalysis, he is a decisive critic of theory and theorizing. Levenson has made a truly original contribution to our understanding of psychoanalytic process, but at the same time, he has repeatedly warned against codifying this understanding into a specific technique of method or treatment. He has always been our foremost student and authority on process, and much like analytic process itself, Levenson eludes capture. He describes the ineffable nature of our work in a way that continues to change, to evolve, never settling onto a single set of concepts that might be elevated to a new orthodoxy. He challenges us to think anew, to experience with a fresh awareness never reduced to our conceptualizations. In this new book, we see Levenson’s work at a new level of maturity, leap-frogging over the pervasive conundrums of our field today. Psychoanalysis across the world is finally coming to terms with concerns raised by Levenson since the beginning of his work. Current international interest in intersubjectivity, mutual influence, field phenomena, the limits of understanding and the importance of negative capacity have been continued interests for Levenson, raised in response to the fixity of a psychoanalytic theorizing that has not taken into account the effects of theory in process itself. This is Levenson’s purview. But in his recent work, Levenson moves further, situating internal private experience in relation to the intersubjective, proposing a nuanced reflection on the role of perception in psychoanalytic process, offering as always a perspective that subtends dichotomies, but that here also finds new integrations without ever simply settling for making sense. One finds a unique pleasure in the encounter with Levenson. More than any other psychoanalyst, we read what Levenson writes, and we have an incarnation of his presence. Reading becomes an experience with him, a process in itself. We find ourselves shifted, in spite of ourselves, out of our familiar stance of knowing into an experience of being, into an encounter with the ineffable, always tilted from familiar moorings in a way that leads us to consider, and more importantly, to experience our work afresh. This is the Levenson idiom, one that offers a rare opportunity to play with him as he pursues psychoanalytic process and the enigmatic nature of experience." Jack Foehl, Ph.D., ABPP, Training & Supervising Analyst, Boston Psychoanalytic Society and Institute, Supervisor and Faculty, Massachusetts Institute for Psychoanalysis and Harvard Medical School, Associate Professor (Adjunct) NYU Postdoctoral Program in Psychotherapy and Psychoanalysis.